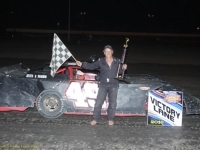 Wauseon Machine & Manufacturing Night was a wild night of racing action at Oakshade Raceway on Saturday evening which was highlighted by Devin Shiels’ exciting UMP Late Model feature win. 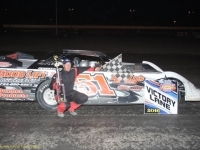 Steve Kester and Devin Shiels both started on the front row of Wauseon Machine and Manufacturing UMP Late Model feature event and the two drivers spent the first five laps racing side by side, trading the lead back and forth. Kester eventually was able to get the best of the Britton, Michigan, driver and open up a little bit of a lead. A little later in the race, Rusty Schlenk began to bear down on the leaders, taking the second position from Shiels on lap 14. 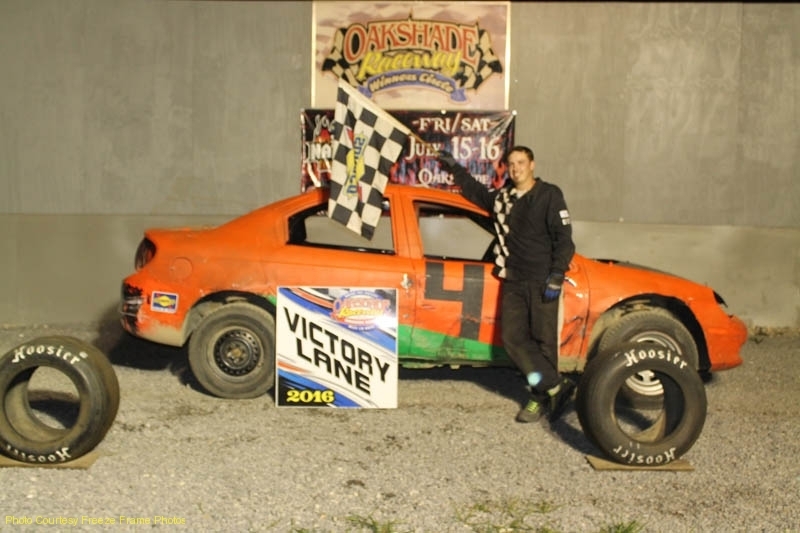 Four laps later, Schlenk took the race lead away from Kester and appeared to be on his way to his second Oakshade feature win of the season. Everything changed just as the leader was about to take the white flag. Schlenk attempted to dive to the inside of Matt Shipley who was running at the tail end of the lead lap going into turn three and got into the side of him. The two drivers got hooked together and brought out the only caution flag of the race. 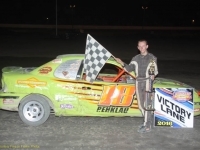 Schlenk had to restart at the rear which meant Kester was back out front and set to lead the field back to a two-lap shootout to the finish. Restarting in the second position was Shiels who got a great restart and dropped to the inside of Kester to take the lead and the checkered flag. 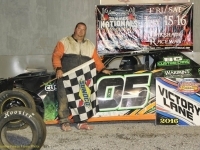 His win moved him up in the point standings to second, just 18 points in arrears to Brian Ruhlman. 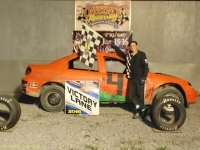 Kester settled for a second place finish in the race with Casey Noonan capping off an impressive run to finish third after having to transfer in from the last chance race and then starting deep in 16th. Brad Wade and Brad Eitniear were the rest of the top five finishers. 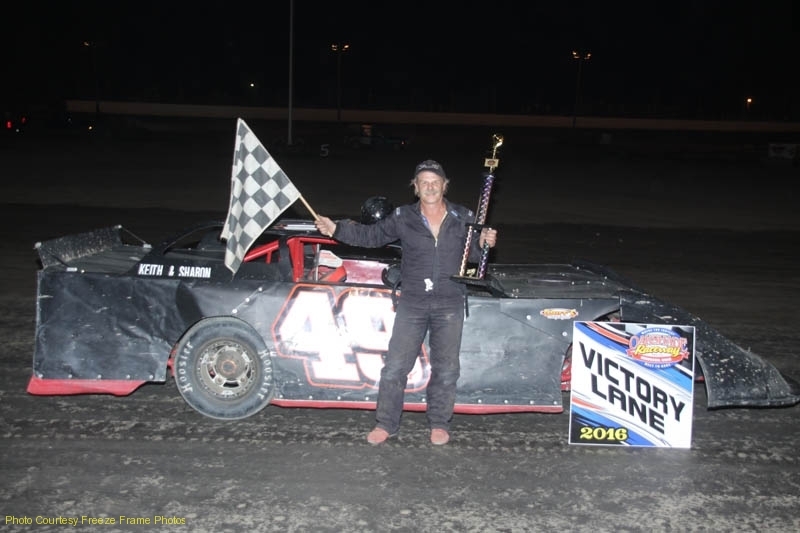 Veteran driver George Lindsey from Adrian, Michigan, led from flag to flag in the Wauseon Machine & Manufacturing UMP Sportsman feature event to pick up his second win of the year. Multiple caution flags kept the field tight behind Lindsey with Mike Jessen trailing most of the race. While Jessen was trying to pressure for the race lead, he had his hands full with trying to fend off Tim Fisher for second. 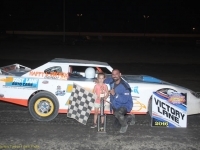 Lindsey was able to hold off Jessen and his win tightens up the points battle in the Sportsman class. Lindsey is now second in points, just 15 behind leader Rusty Smith. Jessen held on to finish second ahead of Tim Fisher. 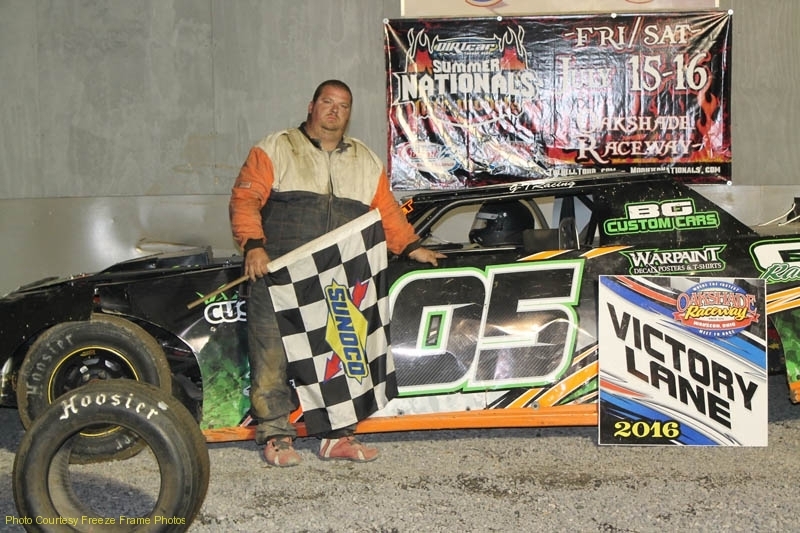 Brian Fisher had a nice run to finish fourth with Bob Gregory finishing fifth. Jeff Foks Jr. and Gregg DeTray had an epic battle for the lead in a caution-filled Wauseon Machine & Manufacturing Bomber A Main. Foks started on the outside of the front row and gained the lead over pole-sitter Tim Murphy. DeTray quickly worked his way up past Murphy for second on lap number two. Foks and DeTray raced side by side lap after lap with Foks running the high line and DeTray hugging the inside. DeTray managed to edge out Foks for the lead on lap 10 after Foks appeared to slip up a little higher than he wanted in turn two, but Foks fought back and regained the lead on lap 11. DeTray led Foks back to the line the very next lap, but caution flag flew for Brandon Clark’s spin which reverted the field back to the lap 11 line up for the restart. In the end, The Holland, Ohio, driver was able to hang on and pick up his fourth feature win of the year with DeTray settling for second. Both drivers are also atop the Bomber points with Foks leading DeTray by 25. Craig Dippman finished third followed by Tim Hancock and Curt Lancaster. Waldron, Michigan’s Brogan Rehklau made a bold move at the start of the Wauseon Machine & Manufacturing Sport Compact A Main to gain the early lead. Rehklau jumped to the outside of Nathan Shaffer and Richard Riffe to race three-wide for the lead the first lap and a half. Finally Rehklau came out ahead by the completion of lap two. 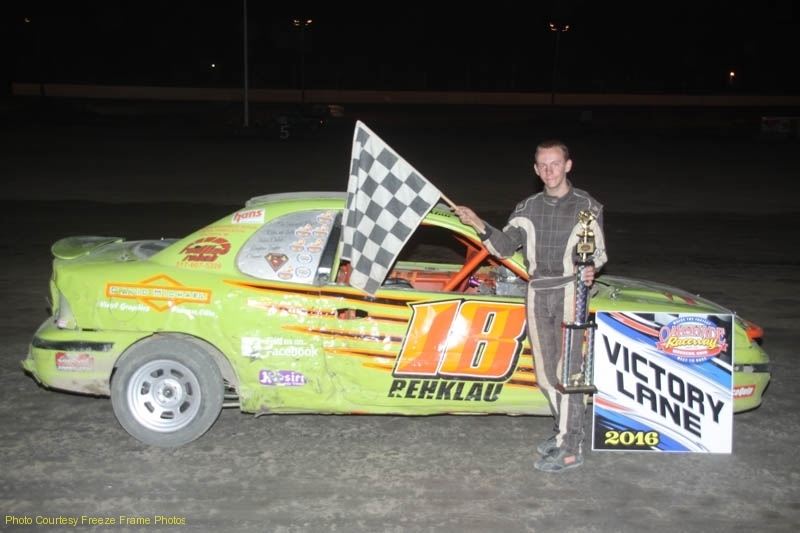 Despite Riffe continually pressuring for the lead, Rehklau was able to hang on and pick up his second feature win of the year. 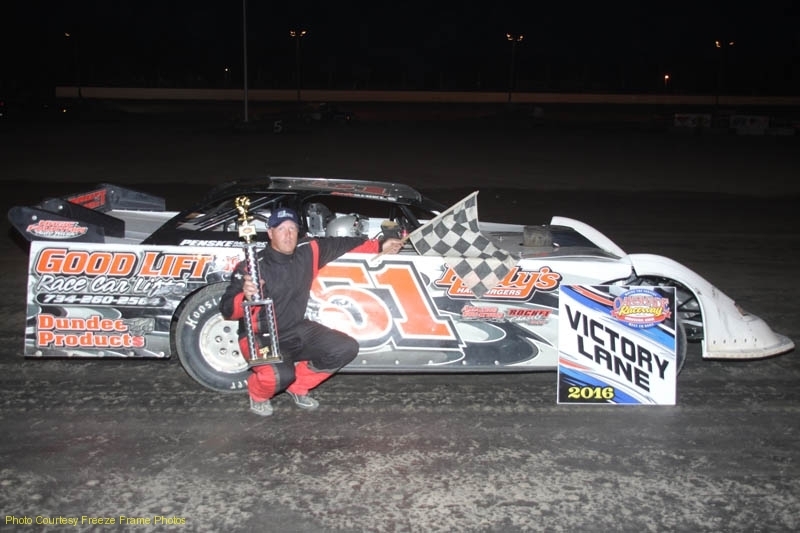 Riffe, who has won seven Sport Compact features this season, came up one position short to finish second. Cory Gumm posted a third place finish with Josh Proffitt and Brandon Paskan finishing fourth and fifth respectively. A scary incident marred the start of the Bomber B Main after Steve Reeves crashed just before making it to the starting line as the field was taking the green flag. The red flag had to be thrown so that Reeves could receive medical attention. He was transported from the track in an ambulance and there is no word on his condition. 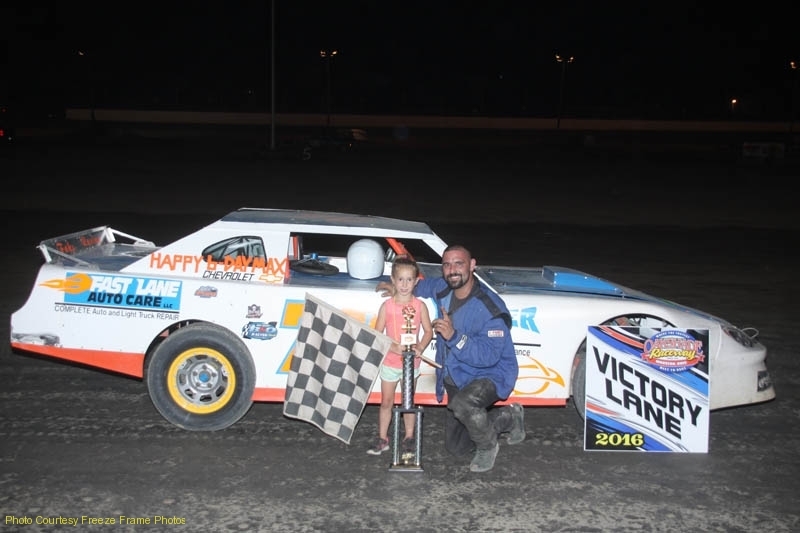 After racing was able to resume, Dylan Burt jumped out to what appeared to be the lead, but officials penalized him for starting a little too early when the green flag waved. Burt would serve his penalty after the caution flag came out early which put him behind Cody Laney and Ted Hill. Those two drivers battled for the lead with Laney coming out on top. Dean Taylor closed in late in the race after started at the tail of the field. After an onslaught of caution periods, the time limit for the event expired which set up a one-lap race to the finish. Laney was the leader ahead of Taylor as they came to the green flag. Taylor looked high in turns one and two and then dove low underneath Laney in turns three and four. Taylor, out of Sylvania, Ohio, just managed to edge out Laney by a nose for the win. Ted Hill held on to finish third followed by Dylan Hough and Matt Lane. The final event of the night was the Sport Compact B Main which had some pretty intense racing action. Paul Miller got the early lead with Rick McDaniel, Clinton Urban and Cameron Tusing racing three-wide for second. McDaniel and Tusing came together in the front stretch which just about stacked up the entire field, but somehow everyone continued on. That is until Tusing got crossed up in turn four and McDaniel also became involved late to bring out the caution flag on lap three. Toledo, Ohio’s Clinton Urban got to the outside of Miller to challenge for the race lead late. The two drivers touched on the final lap in turn two. Urban dropped to the inside of Miller in the final corners and made the last lap pass to earn his first feature win of the season. Miller settled for second with Jeff Goodman, Brianna Ruby and Regan Ford rounding out the rest of the top five finishers. 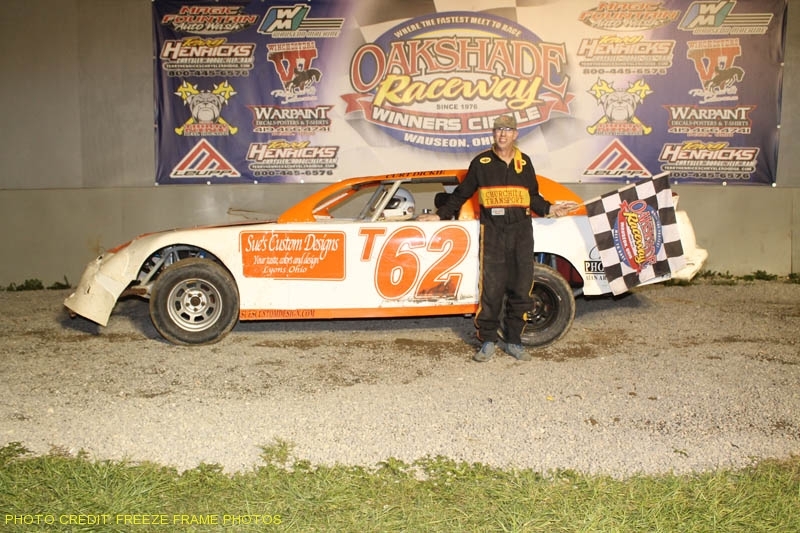 The American Late Model Series (ALMS) presented by Sunoco returns to Oakshade Raceway, home of the Contingency Connection $100,000 Racer Rewards Program, on Saturday, July 30 for a $2,000 to win show. The UMP Sportsman, Bomber and Sport Compact classes will also be back in action with gates opening at 4pm and racing at 7pm.